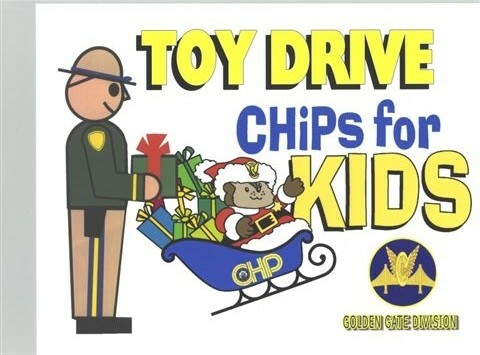 The Golden Gate Division of the California Highway Patrol is asking the public’s help in collecting toys and canned food for needy children this holiday season. “CHiPs for Kids” runs through December 20. Collection spots around the Bay Area are available to take new toys that will be distributed to children in local shelters. “Last year’s toy drive was a big success, and we hope to collect even more toys this year,” said Chief Teresa Becher, Division Chief of the CHP Golden Gate Division office, in a press release. The campaign also spotlights the importance of safe driving, including wearing seat belts and the proper use of child safety seats. Below are the CHP offices that are accepting donations Mondays through Fridays, 8 a.m. to 5 p.m.